When I picked up Kate, she seemed to be a good humor. The tension seemed to have passed. She said a few things about the good candidates they had interviewed and I made some brief responses, but neither of us tried to go back to discuss the events preceding her meeting. We went out for pizza for lunch. After we were seated at a 2-seat table, she looked at me and said, “I wish I could sit next to you.” I reached to hold her hand across the table and didn’t say anything. I could tell she was still feeling the hurt and frustration over the events of the morning. This is especially painful for me. I hate for her to suffer, and I hate it when I am the immediate cause of her pain as I was this morning. Of course, I recognize that it is really her AD that is the source of the problem. The light is really dawning on me that I need to work with her to enable her to do as much as she can while I see that everything that needs to be covered is covered. She won’t be able to get things done without my help. I know it is good for her to continue to do as much as possible for as long as possible. I’m not sure why but when I hit things like this, I begin to wonder how soon I should tell the children. What I fear is that if they know, the grandchildren will soon know. Then it is possible that they will say something to Kate that lets her know everyone in the family knows. Memory loss is generally believed to be the primary symptom of AD. For Kate I think it is the dysfunctional way she addresses everyday tasks. Part of this I believe may relate to memory. Let me give this example that occurred this morning and the previous few days. Kate recently learned that she would be interviewing candidates for a PEO grant this morning. She knew that she would do this with one other other person. Knowing that I would need to take her because she would get lost, I asked her what time she was meeting. I did not ask the location because she has always met in the library. Kate told me she didn’t know, that she had the information in an email on her computer. I asked her again last night what time she had to be there. She said she would check. This morning I asked again. She simply said, “Not yet.” I asked again a little later. Finally, at 9:20 I asked again. She did not seem concerned but a little frustrated that I would keep asking. I told her that I only wanted to know because we might have to be leaving right away. She got upset and started to cry and said would call the PEO sister she was working with. I followed her. Kate didn’t know where her phone number was. She ultimately found it in her PEO directory and called her at 9:25. She found out it was 9:30. We rushed right over to the meeting place. We got there at 9:45 and found the building was closed. We went to another building to see if we could find any information that would help us. We finally learned where the meeting would be and got there right as the first candidate was leaving. I know this was an embarrassing situation for Kate. This is the kind of thing that is going to catch up to her, and her friends are going to recognize that something is wrong. In addition, I talked with Kate last night about her role in this year’s process of selecting candidates. I reminded her that when she finished the last time she said she would only help with the interviewing of candidates and would not get into writing letters of reference and helping the candidates get their applications in online. She did not remember this of course and did not like the idea. I told her if she wanted to do what she did last year, she should get me to keep the records, including contact information, for each candidate because she misplaces the information and then is frustrated when she needs info and can’t find it. This kind of thing is going to become a nightmare. We’re on the edge right now. Dad’s 100th birthday party is now less than 2 weeks away, and we are trying to put the finishing touches on the house, yard, and details. I have mentioned that Kate has worked incessantly trimming plants in the yard for months. She believes (correctly, I think) that pruning the shrubbery helps to let in light that ultimately leads to the shrub’s filling out. The problem I have seen from the beginning is that they looked good when she started, and I wanted to have everything looking good for the party. She has trimmed things back so much now that she is now going to spend money hiring someone to buy and plants new plants to fill in the bare spaces she has created. I have tried to diplomatically mention the need to stop pruning, but she has taken offense. I backed off and have let things go. If it’s bare, it’s bare. I’ll focus on other things. Another issue is that we have been collecting gnats in the house. She does not fully rinse yogurt containers and other containers and plates and leaves them on the counter. Not wanting to hurt her, I told her the other night that I discovered a yogurt container that I had left in the house covered with gnats because it had not been rinsed well. I suggested that we would have to watch that if we wanted to control the gnats. It means nothing. She continues to leave items with food on them; so I am trying to control myself and just not say anything. While I can do this, it is quite frustrating. I am really running up against Kate’s thinking I am always after her about something she has done wrong. Earlier today I said, “Uh Oh” about something I had forgotten. She jumped. She knew I was calling her down about something. That wasn’t it at all. I asked if she thought I was getting on her a lot. She said yes. That coupled with my stronger than intended (or perceived) comment about our patio furniture last week has me trying to be exceedingly careful about what I say. The biggest difficulty I am having is with the shrubbery around the house. She loves to prune and pull leaves off the shrubs. She believes, and I agree, that it has long term benefits by enabling light to get into the deeper parts of the shrubs so they will fill out. The problem is that she has denuded most of the shrubbery in the back yard just when we are getting ready (in 2 weeks) to have almost 100 people over for Dad’s 100th birthday party. She thinks she is getting it looking good, but it looks worse all the time. It looked good before she started. The other thing is that she rarely cleans up the mess. She leaves branches and leaves on the walks around the house and in the yard and in the driveway. The only time it gets cleaned up is the day the lawn person comes to mow. Then immediately it is a mess again. The walkway from the spa to the side of the house has been covered with debris for 2 weeks. I have said something to her a couple of times. The last time she took offense. I have decided to just let it go. We’ll just have to do some last-minute work before the party. Then it will be a mess again. The past two days with Dad have been super ones. On Monday he was up when I got there. Yesterday he was still asleep but awoke easily. This has been a pattern for 3 weeks or so. Prior to that he had always complained that “I’m still asleep.” I am beginning to wonder if the change in his medicine might have made a difference. That’s the only reason I know of. Both of the past two days he has been alert with no delusions. In fact, he entered into a conversation with the daughter-in-law of a woman who eats at the next table from Dad. I turns our her father was from Rogersville where Dad lived while a boy. They chatted about familiar things. He was amazingly clear headed. He also has continued to eat well. I think they are following up on my concerns about his diet and giving him things that don’t choke him as easily. For the most part, however, he has generally been eating well for several weeks starting about 2 weeks after coming back from the hospital. There are several things to report about Kate. First, I hurt her unintentionally last week. It was a Monday night, and I had brought home something for us to eat. It was a beautiful afternoon; so we decided to eat outside. She wanted to eat at the table, but when I went over to the table I notice that it was messed up with potting soil that she had spilled while potting plants. Some of the soil had spilled over onto our new cushions. It had also rained earlier so there was a slight mess on the chairs. I said something to her about her having promised that she would watch out for the news cushions so they wouldn’t get messed up. I didn’t want them messed up so quickly, especially since we had done this in preparation for Dad’s birthday party. I thought that I had made my remark as gently as I could, but it hurt her deeply, and I felt miserable. One of the things I have discovered is that she is very sensitive. I also believe a major part of this is that each event like this is another sign of her inability to do certain things. She is finding fewer and fewer things she can do well. One example of her difficulty doing things is posting a message on Facebook. She asked me to show her how; so I brought up the screen with the space to enter her message and left the room. I’m not sure what happened, but she let me know it didn’t post. I set it up again, and she ran into another problem. Finally, on the third try with me by her side, she did it. The really good news is something that I have mentioned before. In most respects, people would never know that she has Alzheimer’s. She is good in conversation. She only slips up on remembering who people are, but it is usually easy to get around that by being pleasant and acting like she knows them. The other day a neighbor, pulled up in the driveway when she saw Kate working in the front yard. Kate didn’t recognize her at all. She asked Kate for a copy of our neighborhood directory to give to 2 new families that have moved to our street. Kate told her to see me and that I would give them to her. When she asked me about the directories, I told her I was unaware that we had any remaining directories. I did this because Kate had been unable to locate any several weeks ago when we were working on the information for a new directory. The directory is another of those tasks that is a problem for her. I have taken that over, and she hasn’t said a word. There are many things like that. She takes most of them very naturally. Other times she is bothered by my trying to help her with something she feels like she is able to do. I am re-listening to a book by Barry Peterson called Jan’s Story. 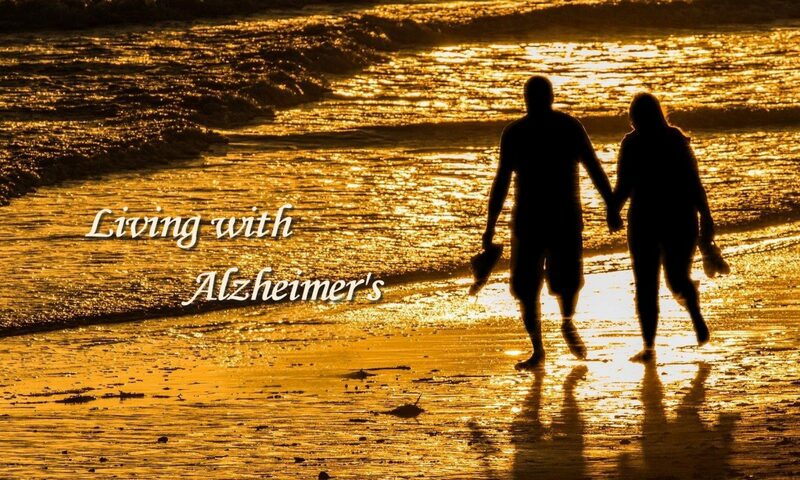 It is an account of his experiences with his wife who had Alzheimer’s. One of the things he mentioned is the change in conversations that he and his wife used to have. That is definitely happening to us. Kate cannot follow anything that is the least bit complex. I am quite accustomed to her saying, “Let’s not talk about it.” Often it doesn’t leave much that we can talk about except to reminisce – past experiences, places we have been, special moments shared together. I am also noticing more memory loss. That is something that most people see as the key problem with Alzheimer’s, but I have felt that in the early years it is the inability to function well on everyday tasks that is the real problem. Before I really believed she had Alzheimer’s, I thought she was having a problem with depression. I have no doubts now that the problem was Alzheimer’s. I continue to believe we are better off for having learned of her diagnosis. It has given us the opportunity to take advantage of our time together. I think we have both been committed to this end, and it has worked. We continue to enjoy ourselves. When we go to dinner as we did last night, it becomes a special moment for us even though it was just a Tuesday evening dinner. I am optimistic that we will have many of these times ahead even as she declines further.